"I had a friend was a big baseball player, back in high school. He could throw that speedball by you, Make you look like a fool boy..."
Thirty years ago a younger Bruce Springsteen sang about high school dreams and adult realities, young hopes dashed on the anvil of hardscrabble blue-collar lives. "Glory Days" is an anthem about ordinary people looking back on when they were the kings and queens of high school, feeling their best days are behind them and that life slips by and "leaves you with nothing mister, but boring stories of glory days". Around the same time a former high school baseball star was living an even harsher version of the song, having seen his big league dreams vanish in a cocktail of drink, drugs, and women. But worse was to come, and Ron Williamson of Ada, Oklahoma found himself living a real-life tragedy: the lost dreams of "Glory Days" called and raised to the dark pathos of "Nebraska", complete with a date with the electric chair. Williamson was destined to be the next Mickey Mantle, until he wasn't. A washed-up small-town hero, his life got even worse when on a winter's night in 1982, not far from his home, a young cocktail waitress named Debra Sue Carter was viciously raped and murdered. An unsolved killing, an investigation going nowhere. Until it lead to Ron Williamson, the fallen idol. On the flimsiest evidence. A scandalous trial, lying witnesses, tainted evidence. But that didn't matter: six years after the murder, Ron Williamson was convicted, guilty, sentenced to die for the heinous crime. A warning to others of how far the mighty can fall. The scourge of drink and drugs and how they can take everything away from you: your hopes, dreams, career, and life. Except Ron Williamson was innocent. 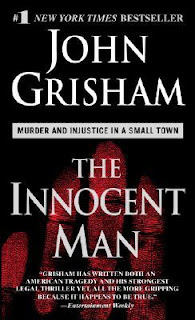 John Grisham is world-renowned for his gripping legal thrillers that explore many aspects of the legal and criminal justice worlds in fictional settings, but here he sinks his storytelling teeth into a real-life miscarriage of justice, and delivers a home run of a book. 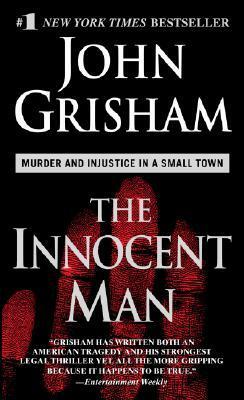 A caveat: there is more procedural and legal detail in this non-fiction work than you would find in a novel, and while I appreciated that as a former lawyer who's had a lifelong interest in miscarriages of justice and the rights and wrongs of capital punishment, for other readers THE INNOCENT MAN may seem to drag in places in comparison to Grisham's fictional thrillers. I found this books absorbing, and heart-breaking. Grisham does a superb job at evoking the circumstances in which Ron Williamson found himself. How he went from baseball star with the world at his feet to death row inmate pondering what his last meal in this world might be. It's also an eye-opening look at how investigations can go awry, as police and others scramble to find justice for victims and their families. Desperate times call for desperate measures, and some of the things law enforcement resorts to in the hunt for answers, the quest to find a killer, can lead to the wrong people and wrongful convictions. It is a little chilling to see how easily this can happen, and even if it's only a minuscule percentage of cases, given the vast amount of crimes investigated every year, it's no wonder that miscarriages of justice happen all too often. This is not a happy read, where the good guys win and life goes back to normal. Any redemption is hard-earned and only partial in nature. Like a Springsteen song, there's poetry in the pain, lyricism in the struggle. This won't be for everyone, but is an excellent book from a gifted storyteller. I first read THE INNOCENT MAN while travelling in North America in 2008. This review is based on my notes and reviews elsewhere I did at the time, plus further reflections and research on the content and case.